We have taken much of the work out of preparing pasta carbonara with our version. 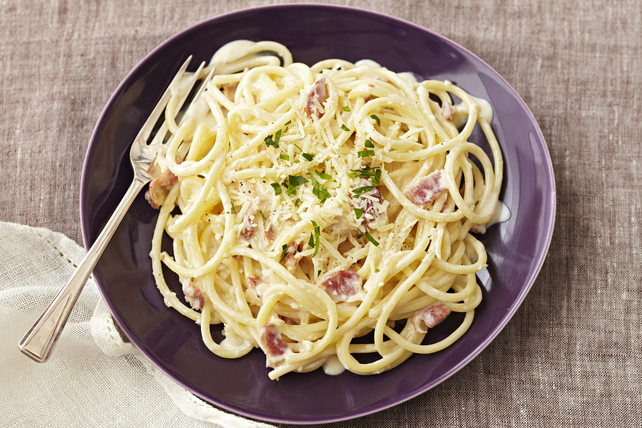 Bacon, Romano and cream cheese are the stars of this delicious take on the classic. Mix cream cheese product, milk and seasonings until blended. Cook spaghetti as directed on package, omitting salt. Meanwhile, cook and stir bacon in large skillet on medium heat until crisp. Remove bacon from skillet with slotted spoon; drain on paper towels. Discard all but 1 Tbsp. drippings from skillet. Add garlic to drippings; cook and stir 1 min. Add bacon and cream cheese mixture; cook 2 to 3 min. or until heated through, stirring frequently. Drain spaghetti, reserving 1/2 cup of the cooking water. Add enough of the reserved water to skillet to reach desired sauce consistency. Add spaghetti and half the Romano; toss to evenly coat. Transfer to serving bowl; sprinkle with remaining Romano and parsley. For best results, use a large pot of water to cook the spaghetti, and stir occasionally as it cooks to help prevent it from clumping together. Substitute Kraft 100% Parmesan Shredded Cheese for the Romano, and/or fresh basil for the parsley.